Furthermore, there are other projects with classification APIs, such as openstack/group-based-policy  and it’s possible that more will want to support classifications in their own APIs, further reinventing the wheel and fragmenting the language used in the OpenStack ecosystem when it comes to defining traffic classifications. This spec introduces the Neutron Common Classification Framework (CCF), a culmination of previous efforts: Common Classifier , openstack/neutron-classifier  and Common Flow Classifier . The previous spec for this RFE is archived at . Common Classification Framework (CCF): the name of this project, which includes the base models and resources introduced below, the API, logic and versioned objects to allow Consuming Services to consume from the framework. Classification: the Neutron resource being introduced for the purpose of defining an atomic traffic classification. Classification Group (CG): the Neutron resource being introduced for the purpose of grouping Classifications, or other Classification Groups, together, specifying a common relation across them. This is the resource that ultimately will be consumed by a Consuming Service. Classification Type (CT): every Classification has a type, defining the format, supported fields and syntax validators of that classification. Classifications API: the User-facing REST API that is provided by the Common Classification Framework to instantiate the resources above. Consuming Service (CS): Neutron itself or a Neutron project, service, extension or feature that is capable of consuming Classification Groups (acquiring them as resources), examples of potential Consuming Services are the ones listed in Problem Description. These services do not talk directly to the Classifications API. User: the end-user, human or machine, tenant or admin, typically cloud consumer, calling into the Classifications API and any Consuming Services’ REST APIs. This spec defines the new kinds of resources to be introduced, an initial set of Classification Types and their models, and the Classifications API in order to define such traffic classifications, which the User will call. The dedicated Classifications API provides a way to define and create Classifications and CGs, storing them like any other resource. CSs are then able to fetch those traffic classification definitions as oslo.versionedobjects (OVO) and feed them to their respective internal network classifiers (i.e. to the mechanism capable of matching on traffic, such as Open vSwitch via the respective ML2 mechanism driver, or iptables - it really depends on what service, and its configuration, is consuming the Classification Groups). What Consuming Services do with the resources consumed is entirely out of scope from the CCF. Updating Classification or CG resources is disallowed in the API, except for changes not related to the traffic classification semantics, such as name and description. With this, having to deal with the complexities of advertising resource changes to CSs is also avoided which, at least for a first version of the CCF, is beneficial as it keeps the project simpler. Consuming Services are not required to keep a local database copy of the consumed classifications, beyond mapping CG UUIDs with Consuming Services’ own resources. Consequently, the Common Classification Framework should prevent Classifications from being deleted if they are in use by at least 1 resource of any Consuming Service. Creation of a Neutron extension to expose the new, first version of the Classifications API, as additional modifications will require new extensions. Creation of models for the different supported protocols’ types/definitions. Creation of a Neutron service plugin and DB layer to validate the Classifications defined by the API according to the types defined and respective supported models, and store them in the database. Adoption of OVO so that every Classification defined becomes a versioned and serializable object, which will be transferred from the Common Classification Framework to Consuming Services. Create CLI using OSC so Users can define their own Classifications with ease. Add a dependency on the CCF’s own extension. Add (or reuse) fields to/in certain API resources with the intent of receiving Classification Group UUIDs (e.g. networking-sfc port-chain’s flow_classifiers field could expect a common Classification Group UUID instead of local Flow Classifier UUIDs). Evaluate the Classifications provided to ascertain whether they are compatible with the specific extension’s classifier (mechanism). Add logic to fetch the CGs provided by UUID, making use of OVO in the process, potentially via neutron-lib (xgerman). Translate the classifications’ definitions to the specific classifier’s mechanism or language (e.g. create Open vSwitch flows matching on traffic). Typically Consuming Services will already have their own CLI, so changes must be made consistently with the changes made to their own APIs and/or classification-fetching code. 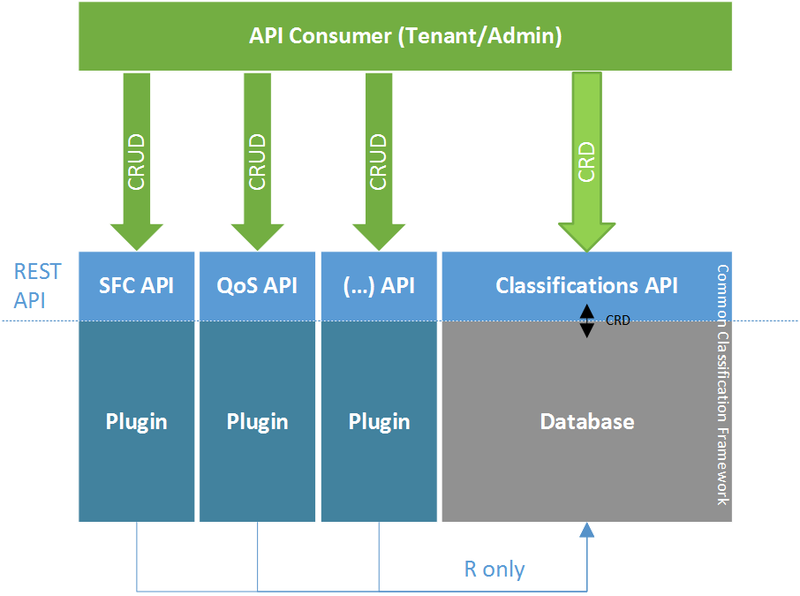 The diagram at  shows the relationship between Users, the Common Common Classification Framework and the Consuming Services. Grouping traffic classifications by individual types, called Classification Types, will allow future types to be added and agreed in the future, while keeping the remaining ones intact. Existing types can of course be updated, thanks to versioning. Thus, this approach follows a modular, rather than a monolithic way of defining classifications. Looking at the existing neutron-classifier project , which was decided as the repo to keep the Common Classifier  (during the Tokyo Summit 2015), there are hints of an architecture like the one proposed here, as can be seen in . As such, this framework is partially based on the neutron-classifier with the major difference that it presents a REST API for Users to define classifications. Classification Types can be introduced or extended (with new fields e.g.) in every release of the CCF. API extensions will be added to reflect these additions in the REST API and maintain backwards compatibility. 1 Classification is of a single type, e.g. either Ethernet, IP, HTTP, or another supported at the time of a specific CCF release. The definition, i.e. fields to match on, depends on the type specified. To clarify, Classification Types define the set of possible fields and values for a Classification (essentially, an instance of that Classification Type). Classification Types are defined in code, where Classifications are created via the REST API as instances of those types. Not all supported fields need to be defined - only the ones required by the Consuming Service - which it should validate on consumption. There are also Classification Groups, which allow Classifications or other Classification Groups to be grouped together using boolean operators. CGs are the resources that will end up being consumed by Consuming Services. The CCF has to be able to check if a Classification Group is currently being used, and prevent it from getting deleted if so. From the Consuming Service’s point of view, Classifications can only be read, not created or deleted. They need to have been previously created using the User-facing Classifications API. Figure  attempts to illustrate this. 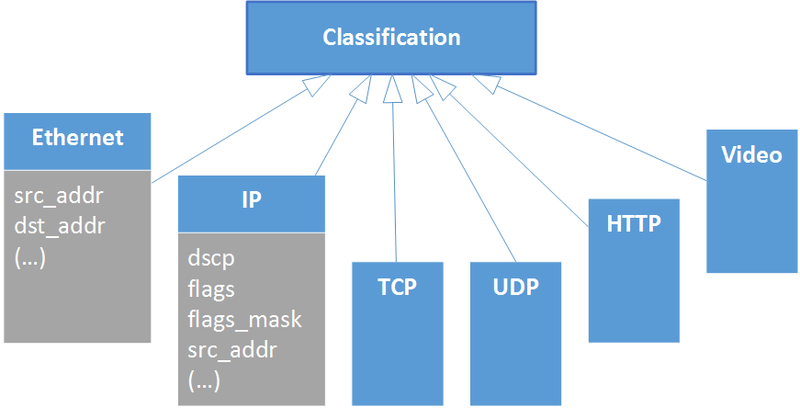 The initial model of the CCF will includes the following Classification Types: Ethernet, IPv4, IPv6, TCP and UDP, which when combined are sufficient to provide any 5-tuple classification. Consuming Services will consume Classification Groups, and not atomic Classifications (that would create more difficulties in terms of the relationships between CCF and CSs databases), any Classification needs to be grouped in a Classification Group to be consumed individually. As such, the “operator” field is to be ignored for Classification Groups that only contain 1 Classification inside. definition type-specific attributes will go here, given their volume I won’t detail them unless requested. Some of the fields of the Classification Types presented above in the database schema, such as length, src_addr, and others, will allow ranges or lists to be input, through the use of commas or hyphens, for example. Masking fields allow the user to specify which individual bits of the respective main field should be looked up during classification. Classification Types are used to select the appropriate model of the Classification and consequently what table it will be stored in. Classification Groups get stored in a single table and can point to other Classification Groups, to allow mixing boolean operators. operator in Classification Group: specifies the boolean operator used to connect all the child Classifications and Classification Groups of that group. This can be either AND or OR. negated per Classification “usage”: specifies whether to negate the definition of the Classification, when mapped to a Classification Group, essentially a boolean NOT. This can be True or False. Please note that Classification Groups cannot be negated using this model. A new API extension is being introduced. The base URL for the Classifications API is /v2.0/. The CCF should provide a way to mark a Classification Group as being in use (or increase the usage count) and a way to check for that and abort certain operations if the group is in use. The CCF does not provide any mechanism to synchronize Classification Groups to Consuming Services. Examples for a Classification Group with two Classifications inside. Modify their existing REST APIs slightly in order to allow for Classification Group UUIDs to be passed, if they don’t already have an endpoint for such (e.g. networking-sfc doesn’t require port-chain API resource changes). Implement the underlying fetching of Classification definitions, with support for OVO. The OpenStack Client will be extended to support the Classifications API. Using oslo.versionedobjects serialized into JSON for the REST API, to support the exact same resources specified in here. With regards to the initial model, it could as well include Security Group Rule UUIDs, BGP VPN resource UUIDs, HTTP, and many more. Work has started as an initial Proof of Concept, available at . After an initial merge on the neutron-classifier repository, work will continue towards the goals outlined in this spec. We request the Neutron team to provide access to the neutron-classifier repo. Given the findings with the PoC code, there is no expectation that existing code in neutron-classifier will be reused, so the repository is to be wiped (but all the history will be kept). Prototype/PoC (Pike-1) (David) - Finished. Finish spec (Pike) (Igor) - In Progress. Acquire rights to merge on a repository (Pike) (Igor) - In Progress.